The Sanctuary Mahi Whenua is a resource that is used by others, whether it be as an educational tool or as a place of contemplation and enjoyment of nature in green space. The space also supports other local initiatives, including Auckland Zoo and Monte Cecilia Housing Trust. Society members are only too happy to share the joy of this space and the abundance it provides with interested groups - contact us for more information or to arrange a tour. Below is a collection of some of the different activities that have taken place supporting the community. At this month's regular working bee, we were visited by many local community members who came to enjoy the space, find out more about the gardens and buy plants in support of Mercy Hospice. Many bikers of all ages visited the Sanctuary Mahi Whenua today - they were riding with the Auckland Transport Star Ride with riders meeting at a central point directly opposite the gardens on Unitec campus. It felt a bit like Monsoon season today while we welcomed Heroic Garden Festival visitors to Sanctuary Mahi Whenua! The garden looks just as beautiful in the rain and we love seeing how much everyone enjoyed exploring. 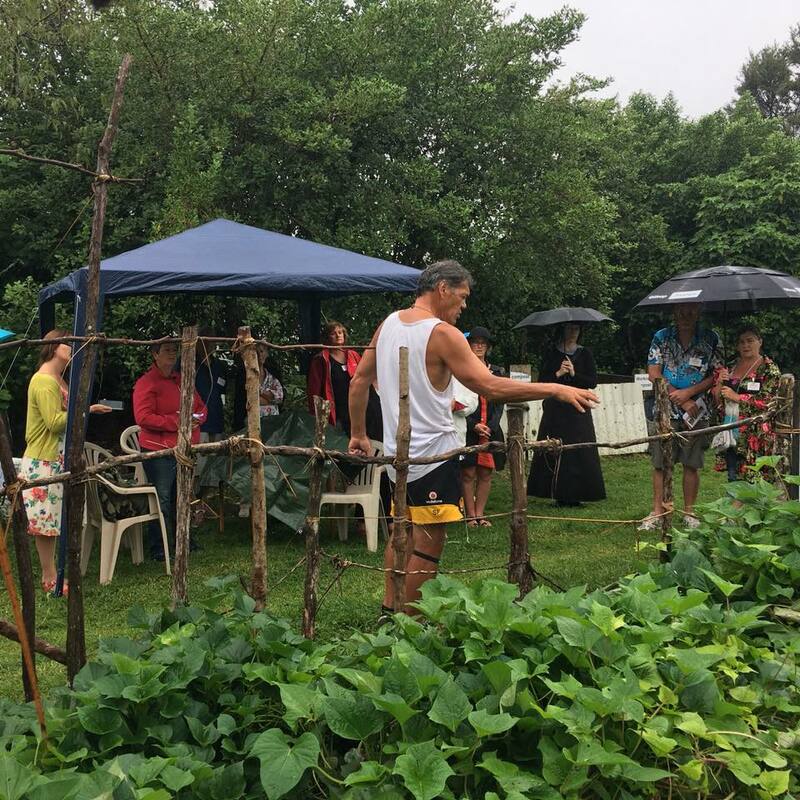 This morning the Sanctuary Mahi Whenua hosted a visit by an enthusiastic group from the Mangere Teaching Gardens and Papatuanuku, Manurewa and Makaurau Marae. The visit was organised by Department of Conservation (DoC) ranger Sandra Jack and colleagues. Their special interest was the food forest and they had many questions for Sarah, Bev, and Trevor who showed them around. (Photo taken by Bev at the Hügelkultur). This morning a group of children from the Unitec Early Learning Centre visited the Sanctuary Mahi Whenua and enjoyed the environs. They visit the Sanctuary regularly and appreciate the ever-changing plants growing in the gardens and changes in the food forest. Early this evening a group of Keas from the Royal Oak Scouts came to visit the Sanctuary Mahi Whenua, and they were shown around by Sarah and Sinead. Currently the Keas have a focus on Earth and sustainability, and enjoyed the opportunity to visit a community garden, eat fresh peas straight from their pods, as well as taste some edible flowers. The accompanying adults (most not in the photo) also enjoyed some of this produce. Seeking moths at the Sanctuary Mahi Whenua tonight! Robert Hoare of Landcare Research is using a 125 watt mercury vapour light to attract insects. The Philippines 'Born to be Wild' film crew are back tonight filming the nighttime activity of spiders and insects following their 11 October daytime filming. Leslie Haines (5th from right) regularly uses the facilities of the Sanctuary Mahi Whenua for teaching the practical-based parts of her Open Polytechnic courses leading to Certificates in Horticulture qualifications. On Saturday this group of students were being guided by Leslie in the use of the hardening-off area. Many people came to enjoy the Family Fun Day at the Sanctuary Mahi Whenua today. In addition to tours of the Sanctuary and viewing of the stunning māra kūmara Māori garden area, there were several activities for children - and those young of heart - to participate in, many using resources from the site such as flax, bamboo, plants and flowers. Read the blog about the day posted by Jen at sanctuarygardendiary.blogspot.co.nz. Filming at the Sanctuary Mahi Whenua today were a team from the Philippines "Born to be Wild", for the Philippines' leading television network GMA-7. Sustainability and biodiversity in an urban setting was their focus, with particular emphasis on filming the insects and spiders. Here senior producer Annalyn Ardoña and videographer Randy Mariñas set up camera shots before presenter Dr Ferdz Recio questions spider specialist Grace Hall of Landcare Research. Richard Main (Gardens4Health) regularly borrows gardening equipment from the Sanctuary Mahi Whenua. This allows members of the Auckland Rugby Development Squad to take part in early morning, heavy-duty community tasks at various community gardens that require this assistance. Richard is about to do a complete clean-up of the returned equipment. Sinead gave practical lessons this morning to students and staff from the Kelston Deaf Education Centre. After planting some seedlings, participants viewed the Sanctuary Mahi Whenua food forest and harvested some greens from this plot they had planted in June. Unitec students studying for a Certificate in Horticulture Services (Landscape Design) did some practical work for assessment at the Sanctuary Mahi Whenua. This is a Unitec online course with a 2-week block study at Unitec, organised by Sue Wake. This morning the year 6 students of Gladstone Primary School (Room 47) spent about an hour studying at the Sanctuary Mahi Whenua. This was part of their background studies on the urban environment. Trevor spoke to them about the various trees, plants and fungi, particularly those in the food forest. The Sanctuary Mahi Whenua was visited this afternoon by Gabira and Kaede, 2 students of the Tottori University of Environmental Studies, Tottori, Japan. They are on an exchange visit to Unitec as part of their studies on environmental sustainability. They were fascinated by the Abyssinian banana plants (Ensete ventricosum) in the food forest, which Trevor told them are gigantic, perennial herbs with stout pseudostems. 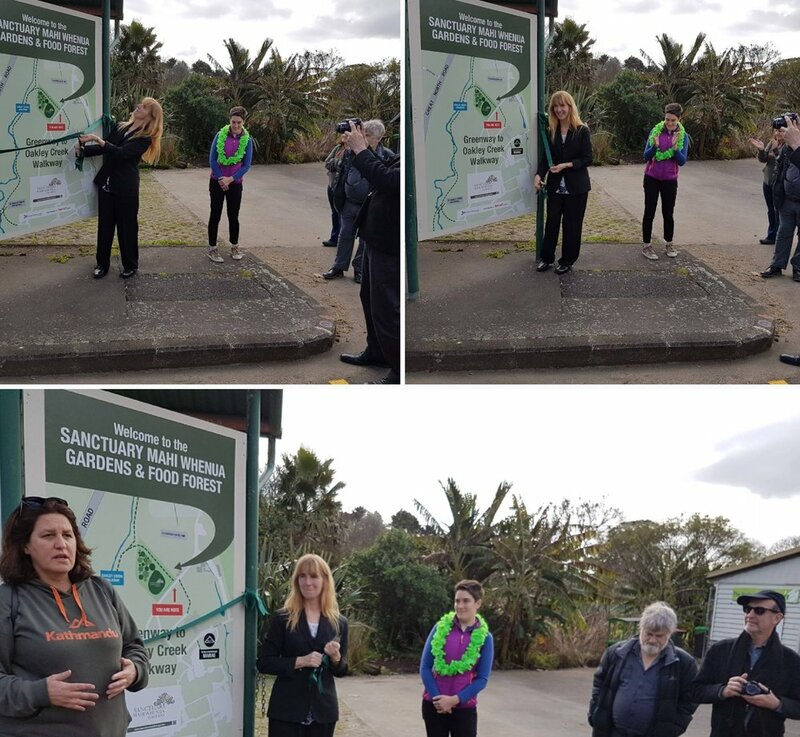 To inform the Community of the existing greenway through the beautiful Sanctuary Mahi Whenua to the Oakley Creek walkway, we installed some signs to help people find their way. We were delighted to host our guests; local Councillor Cathy Casey and members of the Local Board who came along to support our initiative and the Sanctuary Mahi Whenua. This morning a group from the Auckland Upper Harbour community garden network were shown around the Sanctuary Mahi Whenua by Sarah and Trevor. Despite some showers of rain while walking around, they found their visit inspiring, especially the wide variety of native and introduced plants we were growing so successfully in the food forest and surrounding shelter belts. Richard (Gardens4Health) and Sinead gave practical lessons this morning to students and staff from the Kelston Deaf Education Centre. After planting some seedlings, participants viewed the Sanctuary Mahi Whenua food forest before learning about bokashi composting. Sue Wake from Unitec's Architecture group collected examples of plant diseases in the environs of the Sanctuary Mahi Whenua for her practical class this week. Sue regularly collects teaching material from the Sanctuary for her Landscape Design courses, and also brings her students through the Sanctuary to gain on-the-ground experience. Around the Sanctuary Mahi Whenua there are some "rough areas" of long kikukyu grass (Pennisetum clandestinum) and patches of broad-leaved dock (Rumex obtusifolius) growing. These areas are important as they provide food for the small animals cared for by Unitec students as part of their studies towards certificates in animal care. Felicity from Biological Resources harvests these plants on most days for feeding the animals. The food forest of the Sanctuary Mahi Whenua was used by students from Unitec's Environmental and Animal Sciences to provide practical experience in field biology techniques. Associate Prof. Nigel Adams guided them in the requirements for setting of mist nets to capture birds in monitoring programmes. This activity is part of Unitec's "Techniques in Field Biology" course towards a Bachelor of Applied Science degree. This evening the Sanctuary Mahi Whenua hosted a visit of the Manawanui Brownies. With torches at the ready, Trevor and Bev showed them the gardens and food forest, and afterwards in the shed showed them different fruit, vegetables, and gardening tools. The purpose of their visit was to find out how pests were controlled at our gardens, as part of the requirements to earn a badge concerned with gardening. During the afternoon Richard (Gardens4Health), Bev, and Sinead prepared the 2 plots being used by the Kelston Deaf Education Centre in readiness for planting of winter crops by students next week. This afternoon about 30 members of the Auckland Tree Crops Association came to the Sanctuary Mahi Whenua, and were shown around by Sarah, Bev, and Trevor. They were particularly interested in viewing the different trees and their growth in the food forest and shelter belts since the Sanctuary was established in 1999-2000 from a site covered in kikuyu grass (Pennisetum clandestinum). For her working bee task today Kathryn (centre) helped sell some of our produce at today's Alberton market day. As well as our Sanctuary Mahi Whenua produce, on behalf of Alberton and the producer we sold fruit which had been sent up from Hawkes Bay to ensure the market had fresh fruit for sale. Funds from sales help us to cover some operational costs as well as the redevelopment of the Sanctuary Mahi Whenua. This morning a group of 35 enthusiastic members of the Chinese Conservation Education Trust came to the Sanctuary Mahi Whenua for a workshop by Richard Main (Gardens4Health) on fruit tree care. A large branch of one of our plum trees (Prunus domestica) broke during recent windy weather, giving Richard the opportunity to demonstrate to the group the requirements for the safe removal of a large, broken branch. The Sanctuary Mahi Whenua is being used by Unitec students for a final-year project towards their Diploma in Engineering (Civil) by testing the physical qualities of the soil. At the southern edge of the herb garden the lava bedrock was at 0.5 m depth, whereas by the hot composting bins it was at 1.5 m.
Trevor showed Yuki, Erina, Ayaka, Nao, Kaede, and Masayoshi around the Sanctuary Mahi Whenua. These 6 students are from the Tottori University of Environmental Studies, Tottori, Japan. They are on a visit to Unitec as part of their studies on environmental sustainability. The Brewster Ave-Malvern Road eco neighbourhood group from Morningside/Mt Albert visited the Sanctuary Mahi Whenua. They were shown around by Trevor, and were particularly interested in our systems for composting, processing weeds, distribution of communal produce, food forest, insectary and bee friendly areas, and the herb garden. Today was a working bee at the Sanctuary Mahi Whenua. In addition to tasks being done at the Sanctuary, we had a stall selling some of our communal produce at the nearby market day at historic Alberton, Mt Albert. Bev and Trevor set up the stall in preparation for selling. While selling our delicious produce, this is the view that Kathryn, Elli and Dimitri and Birthe enjoyed as they looked after our stall. Funds from sales help us to cover some operational costs as well as the redevelopment of the Sanctuary Mahi Whenua. This morning a group of university students from Kumamoto Gakuen University, Kumamoto Prefecture, Kyushu, Japan were shown around the Sanctuary Mahi Whenua by Trevor. Unitec is a partner institution with Kumamoto Gakuen University, and the students are here for a 3-week course. At the end of October, Richard Main (Gardens4Health) and Sinead gave practical gardening lessons at the Sanctuary Mahi Whenua to students and staff from the Kelston Deaf Education Centre. They planted a range of plants, including sweet corn seedlings (Zea mays). As these cobs were ready for harvesting they were picked, and the very tasty corn within the cobs was enjoyed at the working bee shared lunch on Sunday. At the end of 2016 the Sanctuary Mahi Whenua made a donation to the Monte Cecilia Housing Trust as done in previous years. The donation came from a portion of communal produce sales at the Grey Lynn Farmers Market. The Trust has a vision of a society in which everyone has access to adequate, affordable, and secure housing regardless of race, religion, income or social status. Here’s to a flourishing future for the Sanctuary! The Sanctuary had a stall on Sunday at the summer season monthly Alberton market located just 2.2 km away. We were in the food section of the market amongst the mature trees, and looked up to the historic Alberton House. Bev and Trevor got the gear and produce on site and we were set-up by 8:45 am ready for the 10 am start. Birthe, Jackie and Kathryn looked after this stall, and Sinead took some produce to the Grey Lynn Farmers Market as their community hours for the day. Funds from sales help us to cover some operational costs as well as the redevelopment of the Sanctuary Mahi Whenua. This morning there was a field trip to our food forest by participants of an Agriculture New Zealand Go Organic course, lead by Ellen Schindler (seated). Ellen had an opportunity to check on the Hügelkultur bed in the food forest: she guided the construction of it by Sanctuary members on the 16 October special working bee, read about this on our blog. Richard (Gardens4Health) and Sinead gave practical lessons this morning to students and staff from the Kelston Deaf Education Centre. Here part of the group are with Richard (on right) in the process of planting a series of seedlings. Later they sampled our mountain pawpaw, loquats, and Chinese lantern flowers. Today Ellen Schindler (centre) guided the society and friends of the Sanctuary Mahi Whenua through the steps in the construction of a Hügelkultur bed in the food forest using woody debris. After the area for the bed had been dug out, large logs from tapa cloth trees (Broussonetia papyrifera) were placed as the base. Jen (left) recorded all the steps, and will provide an account on our Sanctuary blog. A busy morning at the Sanctuary with visitors today. A field trip experience was provided for a group of AUT Health students who are doing an environmental paper on design for sustainability. Their visit was organised through Richard Main (Gardens4Health), and Trevor showed this group around. Meanwhile Sanctuary coordinator Sarah showed around a group of garden to plate students from Owairaka District School (organised by Sarah Gambitsis who has come to some of our recent working bees), and did some planting activities with them. This afternoon the office staff of Auckland Council, Central Local Board Services, came to the Sanctuary to assist us in the redevelopment of the food forest on their community day. They cleared Tradescantia (in the bags behind them) as well as mulching an area Jenni had already prepared. Thank you! Richard (Gardens4Health) and Sinead gave practical lessons this morning to students and staff from the Kelston Deaf Education Centre. Activities included propagating and planting out seedlings in the plots we have provided them at the Sanctuary. All participants enjoyed these activities, as well as the opportunity to view the range of crops growing at the Sanctuary. Photographer Sally Tagg and Trevor shooting the cover for the next edition of NZ Gardener at the Sanctuary Mahi Whenua. Amy from Auckland Zoo collects our weekly donation of a crate of organic spinach for some of their animals. The spinach had just been harvested by Sinead and Marlene. Amy is also loading up some forked branches from our Coprosma shrubs she harvested that will be hung up for the giraffes to browse on. Today Julio Bin (on right) visited the Sanctuary, standing with Richard (Gardens4Health) by the area where Richard demonstrated alternative composting methods at the last working bee. Julio is from Auckland Council's Southern Initiative, and is a sustainable enterprise consultant. He discussed with Richard, Bev, and Trevor many aspects of community food production and sustainability, and learnt about some of our initiatives. A workshop on 3 alternative composting methods to hot composting was given in this space by Richard of Gardens4Health (an original Sanctuary founder) at the last working bee. The 3 methods were crop residue management - 'chop, drop and dig', trenching, and sheet mulching - a no-tillage method. See Jen's write-up on these methods. The Sanctuary was visited this afternoon by Chihiro, Chisato, Keica, Kimika, Kosei, and Masayoshi, 6 students of the Tottori University of Environmental Studies, Tottori, Japan. They are on a visit to Unitec as part of their studies on environmental sustainability. A nearby stand of black bamboo provides us with a good supply of stakes for a variety of uses at the Sanctuary (growing above the trees to the right of the photograph). The spreading bamboo has just been cut by Unitec contractors, and we have retrieved a good proportion of it. Our use of the bamboo has helped to reduce Unitec's green waste footprint, thereby assisting them in one small way towards attaining their sustainability goals. Sinead selling our produce on the community trading table at the Grey Lynn Farmers Market this morning. Greens, cucumbers, herbs, white-fleshed Celine peaches, and zinnia flowers were amongst the produce available. Funds from sales help us to cover some operational costs as well as the redevelopment of the Sanctuary Mahi Whenua. 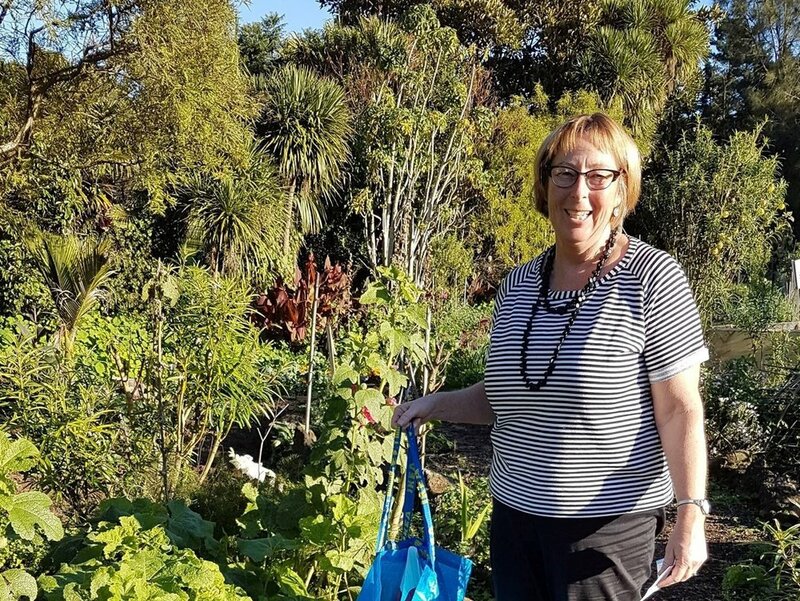 The NZ Gardener magazine editor, Jo McCarroll, visited the Sanctuary on 14 February 2015 during the Heroic Gardens Festival and saw the possibility for an article. So on 20 February a photographic session occurred in readiness for the article written by deputy editor Christine Rush, which was published in April 2015. Here Jo is being photographed by Sally Tagg while holding a basket of produce from the Sanctuary, while art director Sarah Scully is assisting with the lighting. Amy from Auckland Zoo collecting our weekly donation of organic spinach and puha that we supply for their animals. The native puha (Sonchus kirkii) is endangered in the wild. Students from the Agricultural Co-op University, Korea, on a short course at Unitec, learnt about how our community garden operates and what is grown during their visit this morning. Here they learnt about the herb garden. To see how we deal with the "bad weeds" at the Sanctuary Mahi Whenua, visit our blog. This photo was taken at the composting workshop held at the monthly working bee. Foundation students from Unitec visited the Sanctuary Mahi Whenua to collect plant samples to prepare for a presentation as a part of their course in presentation skills. They needed to find a plant for a presentation topic and highlight interesting facts about the plant, make-up models and give an oral presentation on the material. The Sanctuary Mahi Whenua was one of the Auckland gardens open for the annual Heroic GardenFestival. This magnificent display, planned by Sarah, was the scene that greeted visitors to our gardens. Liz posted an album on our Facebook page that gives a photographic journey around the Sanctuary during this memorable weekend. The Sanctuary won the community and teaching gardens pumpkin growing competition in April. As our prize we chose a "mucking in day" by the Auckland Council Bylaws and Compliance team. They renovated our macrocarpa-timber compost bins as their major task of the day.